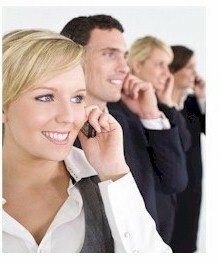 Predictive Dialer Simulation plus IVR Simulation Voice Broadcast Simulation and Auto Dialer and Call Center Simulation. Database Systems Corp. provides a simulation model to assist administrators in projecting the time and results of a predictive dialer and auto dialing phone campaign. Because of the complexity of predictive and auto dialing, our model requires the input of a number of variable parameters to accurately project simulated versus real results. The predictive dialer and auto dialer model simulates outbound phone calls placed by a predictive dialing phone system with answered calls being connected to live agents. Calls can be made predictively, i.e. calls made even when no agents are currently available, "predicting" that when a call finally reaches an individual, an agent will be available. 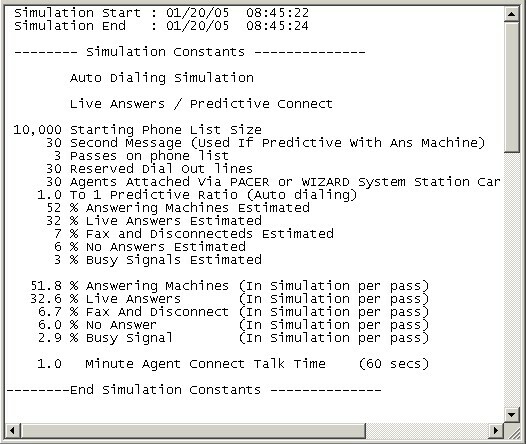 The following is an example of the results our predictive dialer simulation program can produce. Phone Campaign Type - This is the type of phone campaign that is to be simulated. Auto Dialer - This type of phone dialing only dials a number when an agent is available to handle the call. There is no dial ahead feature to maximize agent time. Predictive Dialer - This type of phone dialing dials phone numbers in advance of agents being available to handle calls. This type of dialing optimizes agent time because it eliminates the wait required while calls are being made to unanswered phone numbers. Phone List Size - This is the number of phone numbers contained in the list provided to the predictive dialing system that will dialed. Number Of Lines Dedicated To Dialing (Not Including Agent Lines) - Our predictive dialer system comes with any number of digital or analog phone lines. All or part of this configuration can be dedicated to running a particular predictive dialer campaign. This is the number of phone lines that will be used for dialing the above list of phone numbers. Number Of Agents Handling Calls - The number of agents that will be handling your connect phone calls. The phone system dials numbers from the phone list and when a "live answer" is detected, the call is transferred internally to the next available agent. If no agents are available, the call will be suspended. Number Of Passes Attempting To Contact Each Number - The predictive dialer system can attempt to re-dial phone numbers that were originally answer machines, busy or no answer. If more than one pass is requested, the campaign will require additional time to complete. Generally a predictive campaign will make a maximum of three attempts to complete a call. Average Talk Time Call Length (Seconds) - This is the length of time on average that your agent talks with a call recipient (in seconds). (live answers detected) - predictive dialer detects a live person answering the phone call (default 32%). 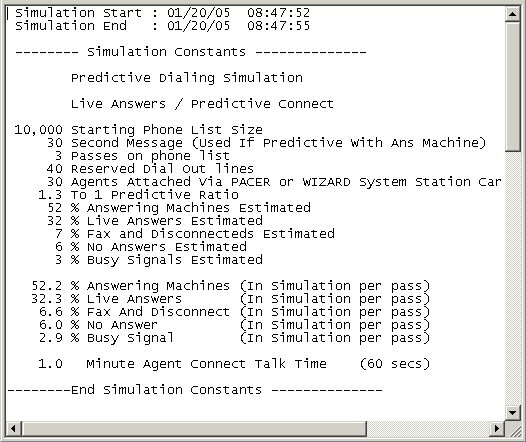 The above results demonstrate how closely the predictive dialer simulation approximated the input parameters set by the administrator. As you can note, the percentages of the input variables and the results achieved by the simulator were within a percent or two of each other. Call Result Statistics - The number of calls connected to a live person was 35.4% of the original list. This equates to the original 32% simulator input parameter plus the number of individuals contacted during the second an third call attempts. Campaign Elapsed Time - The campaign was completed in 2.2 hours including the second and third pass at no answer, busy, and answering machine calls. Telecom Resources - The predictive dialer campaign consumed approximately 4100 minutes of billable phone connect time. Live Answer Service Statistics - Of the 3500 calls that reached a live answer, 479 calls were unable to be connected to an agent because all agents were busy. This represented a 13.5% nuisance rate which fails the FTC guidelines. Agent Productivity Statistics - Agents were effectively on calls 89.8% of the time which falls statistically within the guidelines of predictive dialer productivity numbers generally accepted in the industry. 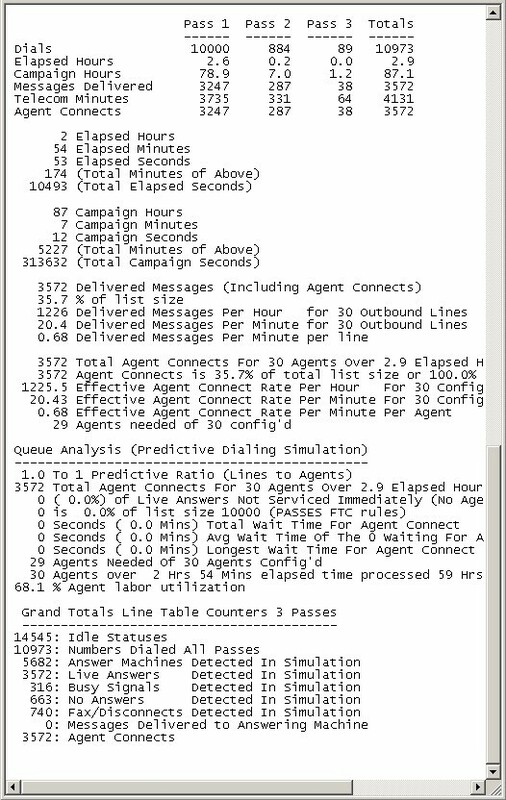 Analysing Results The predictive dialer model successfully simulated the calling campaign where our predictive dialer used 40 output lines and connected live answers to available agents. Model parameters and predictive throttle can be adjusted to operate within FTC guidelines. The above results demonstrate how closely the auto dialer simulation approximated the input parameters set by the administrator. As you can note, the percentages of the input variables and the results achieved by the simulator were within a percent or two of each other. Campaign Elapsed Time - The campaign was completed in 2.9 hours including the second and third pass at no answer, busy, and answering machine calls. Telecom Resources - The auto dialer campaign consumed approximately 4400 billable minutes of phone connect time. Live Answer Service Statistics - Of the 3500 calls that reached a live answer, 100% calls were connected to an agent because an agent was always available before calls were placed. This represented a 0% nuisance rate which falls within the FTC guidelines. Agent Productivity Statistics - Agents were effectively on calls 68.1% of the time which falls statistically within the productivity guidelines generally acknowledged in the industry. Agent productivity is solely a function of the quality of the list that is being used, as well as other factors such as time of day and average talk time. The simulator inpu parameters can be adjusted to allow for more connected calls during after work hours. This would produce a higher agent productivity percentage. 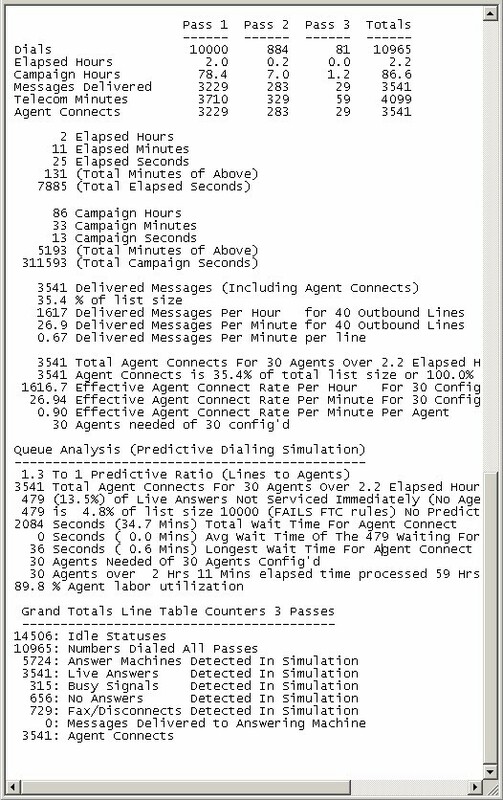 Analysing Results The auto dialer model successfully simulated the calling campaign where the dialer used 30 output lines and connected live answers to 30 available agents. Model parameters can be adjusted to demonstrate the effect upon call campaign elapsed time as well as agent productivity. Factors that would increase productivity include higher quality phone list with more live answer connected calls. Also, if the average talk time between the agents and the called individual is increased, agent productivity likewise will increase. Comparing the two simulation runs demonstratres the difference between these two dialing techniques. If all other factors are equal, a predictive dialing campaign takes less time to complete than an auto dialing campaign. This is somewhat intuitively obvious. Predictive campaigns have the potential of live answers hanging up when no agent is available, thus lost opportunity and possible lost revenue. The predictive dialer campaign consumed less telecom resources because of the negative effect of live answers hanging up when no agent was available to talk. The auto dialer campaign is more effective when the average talk time is greater or when the live answer connect rate is higher. The predictive dialer campaign is more effective conversely when the average talk time decreases or when the live answer rate is lower. The predictive dialing campaign runs the risk of being in violation of FTC regulations when the dropped call or nuisance rate exceeds 2%. Auto dialing campaigns by definition have no dropped calls and thus not in violation of this particular FTC regulation. The PACER phone system is a state-of-the-art predictive dialer that handles inbound and outbound phone calls for small to large call centers. Calls are either initiated by the phone system or accepted from the outside and distributed in an intelligent fashion to your service agents using ACD systems. Developed with industry standard components (Dialogic, Intel, and Windows), the PACER phone system has features and functions that can only be found in large scale PBX�s, but at a fraction of the cost. And the PACER phone system has predictive dialer capability that cannot be found in most of these larger phone systems. With the optional IVR systems available with the PACER phone, callers can perform self-help functions without speaking with your agents by making simple selections using the keypad on their phone sets. Plus the PACER phone system can connect calls to your employees who are working at home or in remote offices.